Yamaha Motor will honour the memory of Jarno Saarinen during an exhibition hosted by the Embassy of Finland in Tokyo to commemorate 100 years of diplomatic relations between Finland and Japan. Saarinen, from Turku in Finland, was one of the most talented motorcycle racers of his generation. 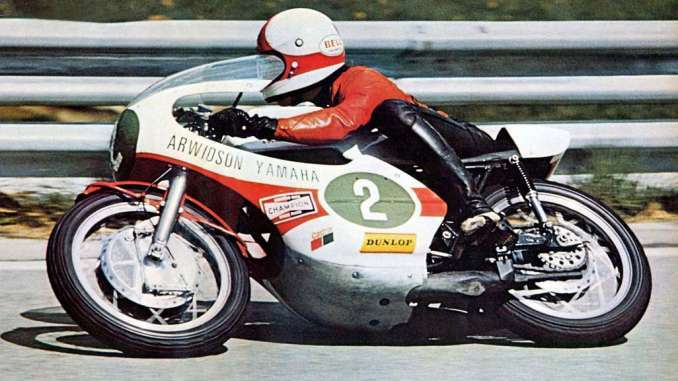 In 1972, his first year as a Yamaha rider, Saarinen took four race wins aboard the two-stroke Yamaha TD-3 on his way to being crowned 250cc World Champion. The Finn finished second in the 350cc World Championship the same season, with three wins to his name aboard Yamaha’s TR-3 machine. In 1973 Saarinen was leading both the 250cc and 500cc World Championships when he was tragically killed in an accident at the Nations Grand Prix in Monza, Italy. Saarinen, who was inducted into the MotoGP Hall of Fame in 2009, remains the only Finn to have won a motorcycle road racing World Championship, winning 15 Grand Prix races during his career. To honour the memory of Saarinen and all that they achieved together, Yamaha Motor will display a tribute to the Finn during a public exhibition in the Finnish Embassy in Tokyo on 14th April, just one of the events organised to commemorate 100 years of friendship between Japan and Finland. During the event the President of Yamaha Motor Corporation, Mr. Yoshihiro Hidaka, will present Saarinen’s widow, Soili, with an album of original photographs from their visit to Japan in 1972, in celebration of Jarno’s 250cc World Championship win that year. After the 14th April, the exhibition continue at Yamaha Motor’s Communication Plaza in Iwata, Japan from 16th April till end of May.